A tip of the virtual hat to Pat Adams, who uploaded these two inspection reports to the Yahoo! 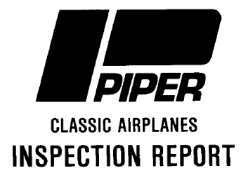 Piper Cub Builders List. They are PDF files, and you need the free Adobe Acrobat Reader in order to open them. If you don't already have it on your computer, you can download Acrobat Reader here.